Some of the most important stocks in the world are at such critical levels that we’d be fools to ignore it. More specifically, I’m referring specifically to financials, and broker dealers and regional banks in particular. As we’re all aware, financials peaked in 2007 before the epic collapse throughout 2008 and into early 2009. The repercussions of those events were felt all over the world. Some people are calling for a repeat of that period. Could we actually see it? Maybe. But I think it’s going to depend a lot on the outcome of the current battle taking place between buyers and sellers at one of the most critical levels in the history of these stocks. 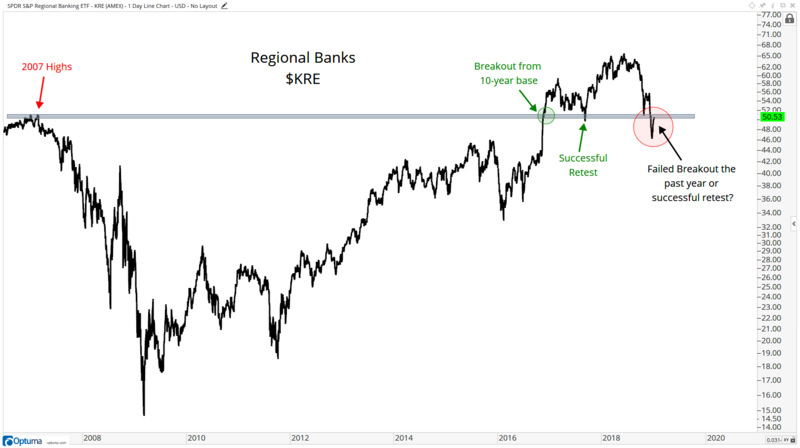 In late 2016, regional banks were able to break above the 2007 highs to complete a near decade-long base. That breakout was then retested successfully in the second half of 2017. As we see here, prices last month fell back below those 2007 highs. The question that is presented here is whether this is just a messy retest of the 2007 highs, or if that breakout last year was a massive failure? The implications of this being a failed breakout would likely be substantially lower prices, at least another 20% lower. At the 2007 highs, the price of the SPDR KBW Regional Banking ETF (NYSEArca: KRE) was $50. And we’re at $50 now. We’re seeing literally the exact same thing happening in broker dealers and exchanges. Look at the breakout in 2017 above the epic 2007 highs. 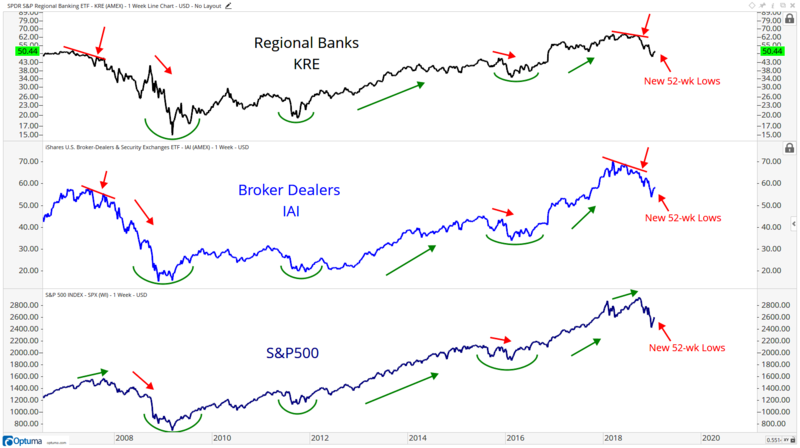 The iShares Dow Jones US Broker Dealers ETF (NYSEArca: IAI) is in a similar predicament as regional banks. Was that breakout a massive failure and we drop another 20%-plus in prices? Or is this just a messy retest? 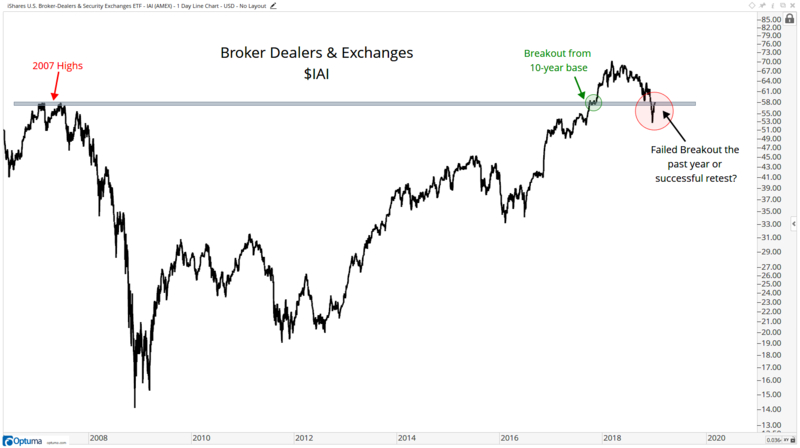 At the 2007 highs, $57 was the price of IAI. And we’re at $57 now. This is what I’m calling the 50 & 57 market. Stock market crashes aren’t happening if these indexes are above their respective levels. The big problems will occur with these indexes below those levels. You can see why I’ll be following these trends closely over the next month here and in Breakout Profits.